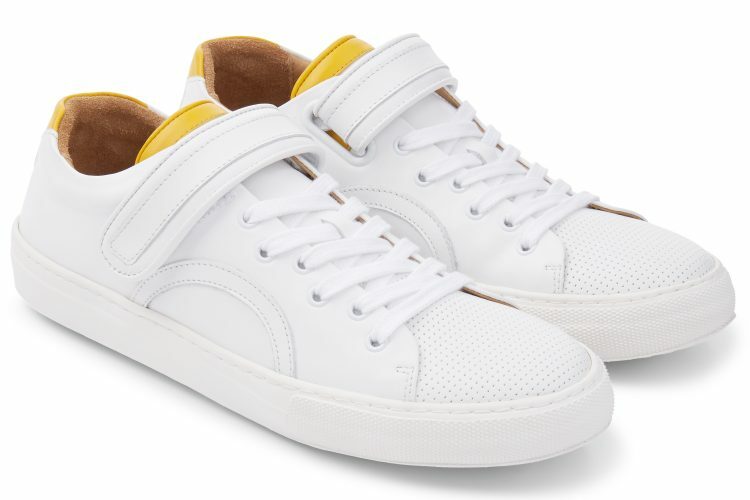 It’s not as if TV chef, entrepreneur, restaurateur and social campaigner Jamie Oliver needs another string to his bow, but with the launch of the Limited Edition JO-18 unisex sneaker range, he can also add ‘shoe designer’ to that already exhaustive list. Limited to a run of just 400 pairs, the JO-18 comes in hi-top and low-top designs, which are available in two exclusive colors. Made with prime Italian leather, each pair features a retro-style Duffer sole and a unique Comfort Forever Footbed, which guarantees comfort and durability. With the JO-18 hi-top reminiscent of early classics like the Nike Jordan 1 or Air Force 1 and the low-top looking like a stylish reboot of the Adidas Stan Smith; this range should be enough to keep any retro sneaker head happy. It was then that Jamie reached out to his friends at UK footwear brand Seven Feet Apart, who in 2017 had made a pair of bespoke shoes for the couple’s baby, River Rocket. Both Jools and Jamie had become firm fans of their sneakers ever since, so the chef called them to discuss the possibility of making a unique pair of sneakers as an anniversary gift for Jools. But how hands-on did the chef actually get during production? Matt Bagwell, Co-founder and Chief Brand Officer at Seven Feet Apart explains: “Jamie was heavily involved in every decision we made; the style, the material, the colors, the box. As he himself suggested, making the ultimate sneaker is like gathering the best ingredients together for a dish. It was during this process that they hit upon the idea of producing a low-top sneaker too, with a colorway that matched the yellow from Jamie’s forthcoming Italy cookbook. And rather than just stick to two pairs, they decided to make a limited edition run of 400 pairs, and all in a custom box with a limited edition illustrated card, signed by Jamie – this certainly wasn’t a project that lacked ambition. Check the shoes out at Seven Feet Apart's store, and follow Jamie Oliver on Facebook, Instagram, Twitter, and Pinterest.